Guys and Gals ! Mango season is here. My favorite time of the year when you can experiment with mango in not only desserts but also cocktails, salads, soups, entrees and appetizers . I love mangoes, so when mango season comes around I try to use mangoes in everything . Have you ever tried a cold summer soup that calls for mangoes . Soon I will post my Refreshing Summer Mango Soup . 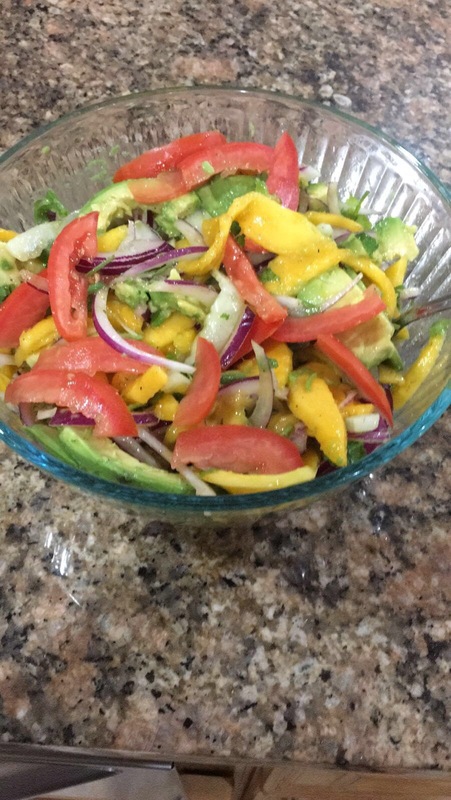 This Salad is deliciously colorful and very pleasing to the eyes as well. It has vitamins and nutrients in abundance. 2 Add salt, red chili powder and lemon juice mix and refrigerate for 30 mins.